Based on Roland's iconic TB-303, and a staple of acid music from back in the day, Tabletop's TT-303 Bassline Sequencer is perfect for bass accompaniments to your leads. Whether this is your first introduction to the device or you're back for the nostalgia for one of your favorite machines, read on. There's so much you can do with this device! The machine's sound comes from a single oscillator that generates either a square or sawtooth waveform, to which you can apply an additional six control parameters that sit at the top edge of the machine. Adjust the tuning to transpose the pitch up to 12 semitones in either direction, set the cut off frequency to allow only lower tones pass through the filter, or adjust the resonance to emphasize certain frequencies. You also have the ability to control the envelope modulation, which shapes the harmonic content of a note; decay, which adjusts the time a note takes to fade out; and the accent, which is how heavily accented notes are emphasized. All these parameters are as automatable as the params on any other device! To get started on making a pattern, tap the note button next to the Edit Step LED. That causes a note to be played for that step instead of a rest, then select the button on the keyboard of the pitch you want that note to be. Set the note an octave lower or higher by enabling the Down and Up buttons, respectively. Tapping the Accent button causes that note to have more emphasis than the others, and tapping Slide causes a smooth transition to appear between that and the next note, as opposed to having two well-defined notes. Using the pattern banks A-D and 1-8, you can store up to 32 total patterns. In the Edit Pattern menu, in addition to the usual Cut/Copy/Paste/Clear functions, you have the ability to set the pattern to a 1/8 or 1/16 interval, shift the pattern left or right, and transpose the pattern by up to +/-12 semitones. 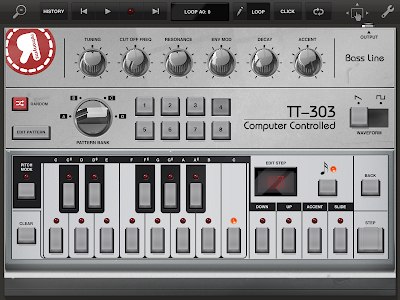 But the 303 also provides the options of randomizing and altering patterns, accents, and pitches. Randomize tends to create new patterns mostly from scratch, whereas alter tends to take your pattern and change only smaller bits of it. Using these two features are great tools when you're looking for a bit of inspiration or need to tweak your sound just a touch. 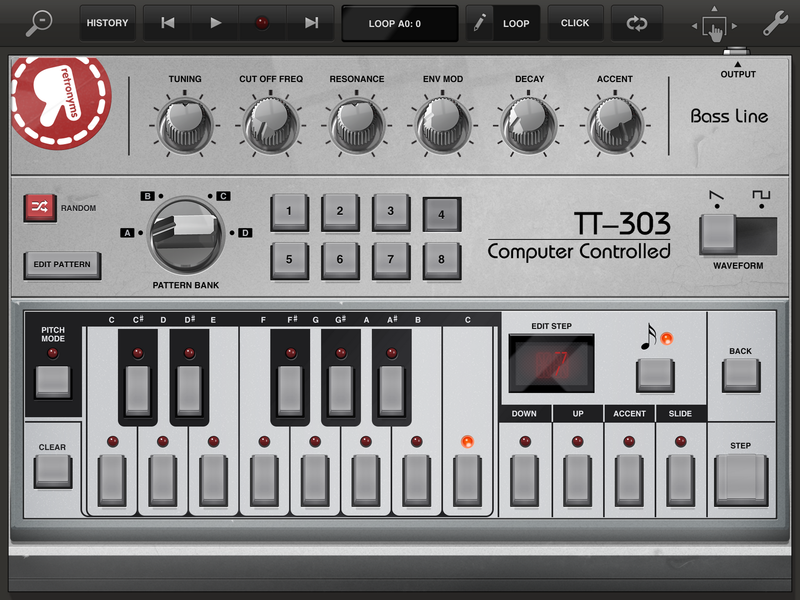 So now that you know how to use the 303, see/hear it in action in the demo songs Buckle Up and The Dark Crystal. If that's not enough and you want to make good use of it yourself, you can purchase the 303 at the discounted price of $2.99 for the next two weeks!